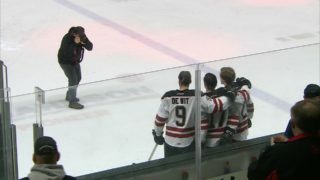 The Red Deer Rebels didn’t stray far from their game plan Saturday and their due diligence paid off with a Western Hockey League victory. 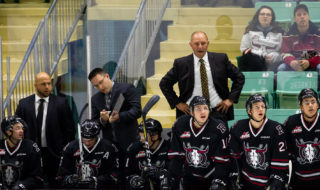 “We kind of stayed with our game tonight,” said Rebels GM/head coach Brent Sutter following a 5-2 win over the Swift Current Broncos before 4,020 fans at the Enmax Centrium. The Rebels led 2-0 after two periods and then pulled away with three straight goals in the final frame before giving up a pair late. “We wanted to be better in the third period than we were last night,” said Sutter. 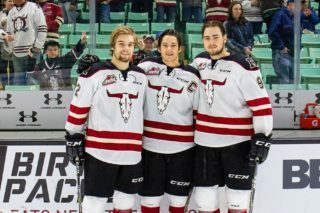 “Last night (in a 4-3 win over the visiting Calgary Hitmen) I felt we were on our heels a bit in the third. Following a scoreless opening period in which Broncos netminder Isaac Poulter faced 15 shots and denied Chris Douglas, Josh Tarzwell and Oleg Zaytsev on clear cut scoring opportunities, Brandon Hagel opened the scoring with a power play tally 43 seconds into the middle stanza. Hagel notched his second of the season, on the power play, converting a cross-ice feed from Alex Alexeyev while all alone at the side of the net. Dawson Barteaux followed with another man advantage marker eight minutes later, beating Poulter with a wrist shot from just inside the blueline. “Our power play got us a couple goals and kind of got us going,” said Sutter. Austin Schellenberg notched the eventual winner early in the third period — taking a stretch pass from Ethan Sakowich and finding the far side of the net from the top of the right faceoff circle — and Zak Smith made it 4-0 less than two minutes later, cashing a centering pass from Arshdeep Bains. It was Smith’s first-ever WHL goal. Josh Tarzwell followed with a short-handed goal, burying a rebound after Reese Johnson created a turnover and his backhand was stopped by Poulter. With a comfortable lead, Sutter found more ice time for his secondary, less experienced skaters, the rest of the way. “You give some other guys opportunities to play more. Some of the older guys who have played more can get a bit of a rest and let the young guys play, and I thought the young guys did a good job,” said the Rebels boss. Rebels rookie netminder Byron Fancy was pitching a shutout until Alexeyev committed a glaring giveaway and Matthew Culling scored from the low slot at 12:23 of the third. 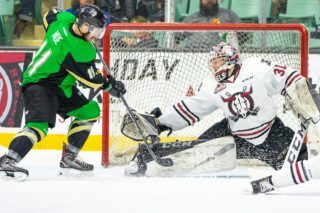 Then, with Carson Sass and Hagel serving cross checking and hooking penalties called at the same time, Connor Horning’s point shot deflected off a Red Deer stick and past Fancy. Fancy made 24 saves while posting his first-ever WHL win. “It’s awesome, it’s a great feeling,” said the 17-year-old. “He played well, he was really solid,” said Sutter. “He was just solid, he didn’t give up much. Fancy was impressed with his teammates. “It was a great game, we outplayed them the whole game pretty much. The boys came to play and executed pretty much the whole game,” he said. The Claresholm product admitted he didn’t truly settle in until the second half of the first period. Fancy made back to back stops on Culling and Max Patterson late in the opening frame to really get into the game. “Getting a few pucks on me, getting the feel of the puck . . . that helped calm me down a bit,” he said. 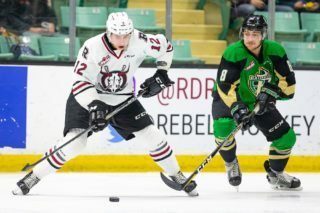 The two power play goals were Red Deer’s third and fourth of the season and the team sits seventh overall with a success rate of 26.7 per cent. “It’s always nice to have skill on the power play, but it’s establishing shots, establishing some traffic around the net and making sure pucks are directed there,” said Sutter. “ Skill guys can make plays but they have to have the ice to make them too. Notable: Barteaux picked up two assists and was named first star of the game for his three-point effort, while Hagel, who had a helper to go with his goal, and Tarzwell were selected as the second and third stars . . . Poulter made 35 saves for the Broncos, who have scored just three goals this season. The current team is a mere shell of the 2018 league championship version and is winless in four starts this fall . . . The Rebels improved to 2-2 and are in Calgary Sunday for a 4 p.m. engagement with the 0-3 Hitmen. Red Deer will host the Saskatoon Blades Tuesday.